A: The NT is measured, and when correlated with your age-related risk for Down syndrome, your doctor can calculate a higher or lower risk of carrying a Down syndrome fetus. 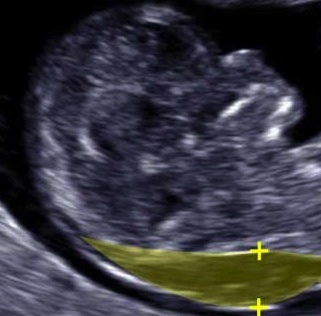 The measurement of the NT presently identifies about three in four fetuses with Down syndrome. So, for example, if your age-related risk of Down syndrome is 1 in 365, and the NT measures 5 mm, then the adjusted risk is 28 times higher or 1 in 13.